The first settlers to move west were in search of rich farmland, and plentiful supplies of fresh water. It would bring them into constant conflict with the Native Americans, but in time, Pennsylvania would become a peaceful colony where some Native Americans were allowed to join white society. With them would come their medicine and discoveries, one of which was oil. Many settlers also believed that these oils were medicinal, and "hawkers" sold bottles of it. As early as 1792, a cure-all called "Seneca Oil" would be sold as a medicine that alleviated pains, discomfort, and other problems. The nearby Allegheny and Kiskiminetas river valleys also held oil, but beneath the ground, where as early as 1815 it was contaminating several of the brine wells that supplied a booming salt industry in the Pittsburgh area. In time many of these first wells would be shut down as the business men in Pittsburgh feared for the loss of profits in their salt wells, never realizing the money they could make in oil. They believed all it did was poison their salt wells and caused many financial ruin. In the early 1850s, a Pittsburgh druggist named Samuel Kier began selling bottled oil from his father's brine wells as "Pennsylvania Rock Oil", but was met with little success. On the verge of selling his fathers wells to a group of local salt dealers, he heard about the work of Colonel A. C. Ferris. 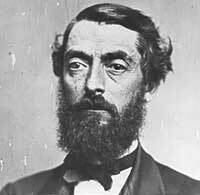 AC Ferris, a whale oil dealer, processed a small amount of Kier's "tonic" to make lighter oil that burned well in a lamp. When Kier heard about this, he began using a one-barrel whiskey still of his own to convert his rock oil into lamp oil. After Kier upgraded his still to five-barrel capacity, Pittsburgh forced him to move his operation to a suburb out of fear of an explosion. When George Bissell, a New York lawyer, learned of Kier's operation, he hired Benjamin Silliman Jr., a chemist at Yale University, in 1854 to see if Seneca Oil would yield lamp oil. 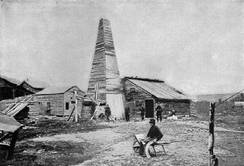 Silliman successfully distilled the oil into several fractions, including illuminating oil already known as kerosene. 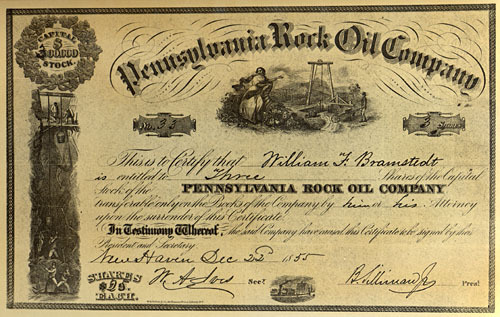 Armed with Silliman's results, Bissell received financial backing to form the "Pennsylvania Rock Oil Company", which later became the "Seneca Oil Company" from financial backers such as James Townsend, president of a prestigious bank in New Haven. Into this picture stepped �Colonel� Edwin Drake, an unemployed railroad conductor and express agent, who was staying at the same New Haven, Connecticut hotel as Bissell and his partners. Befriending them and using his charm and intellect, he was hired in 1857 to visit Titusville, a town on Oil Creek. Drake's only qualification for this assignment was a free railroad pass remaining from his previous job, thus saving Bissell and his partners the expense of paying for a prospector to travel the area. Drake had never been in the military, but when he returned to Titusville the following year to commence operations as a Seneca Oil Company agent, his employers passed him off as a colonel to gain the respect of the locals. How Drake chose Titusville to launch their new oil venture dates back to his time working on the railroads. There he heard the stories from the remaining local Native Americans, most of whom had converted to white society, but still spoke of the �black medicine� beneath their feet. In fact the area was full of oil seeps which historically were collected at Oil Creek by damming the creek near a seep, then skimming oil off the top of the resulting pond. Drake tried this at a seep once used by a sawmill to produce oil for lubricating the mill machinery, but even with improvements and opening up other seeps in the area, he managed to only increase production from three or four gallons to a still non-profitable amount of six to ten gallons a day. In no time his wells began to be known as Drakes Folly, and no "Colonel" in front of his name was going to save him. He tried everything in his power. His workers tried digging a shaft to mine the oil, but groundwater flooded in too quickly for the workers to continue, and soon the local town people began to wonder if these wells would destroy their town. Finally, Drake decided to drill a well and locate the source of the seep oil, using the same steam-powered equipment used to drill brine wells. He hired a blacksmith from Pittsburgh named �Uncle� Billy Smith, who had drilled brine wells for Kier and others in the Pittsburgh area. Smith came to Titusville with his son Samuel and began drilling in the summer of 1859. The progress was excruciatingly slow, usually less then three feet a day in shale bedrock. On August 27 they reached a depth of 69� feet just as Drake was reaching the last of his funds. Townsend and the rest of his backers were losing faith in the profitability of oil and had decided to close up shop. The day Drake arrived was August 28. That day Billy and Samuel pulled their drilling tools from the well they had dug the day before and they noticed oil rising in the hole. After installing a hand-operated lever pump that they borrowed from a local kitchen, the first day�s production was about twenty-five barrels. Soon production would drop off to 20 barrels a day, unremarkable from today�s standards, but at the time, smart businessmen saw the future. Overnight the area transformed dramatically. From a quiet farming area, it quickly became an oil region. The flats in the area were all leased and towns sprung up from nowhere. Like the gold rush out west, the rush for black gold would foretell a future of limitless profits from oil. Whole areas would be transformed from backwater towns to modern cities. As businessmen saw the profits they realized they needed to make improvements. With muddy trails that were becoming legendary, transporting the oil would become a problem. Technology was racing as were profits and soon Pennsylvania would become responsible for 1/3 of the world's oil. 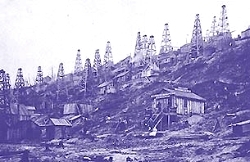 The oil boom would end in 1901 as oil began to be struck in Texas, California, Wyoming and other western areas. In fewer than 50 years, towns in Pennsylvania were thrust into the modern age thanks to oil. Businessmen like Rockefeller saw the future and learned from the mistakes that Drake and others who followed him made. In time the story of Drake and his wells would fade, but the lessons he learned and the profit potential he saw would fuel an industry forever.